I'm trying to replace my takeout habit with healthy home-cooked meals, but the idea of a sink full of pots and pans puts me off every time! 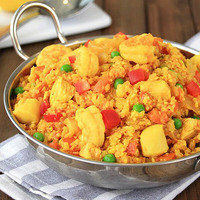 Can you suggest some recipes that can be made with just one pot or pan? 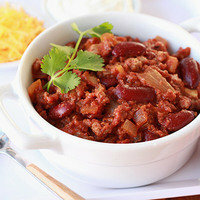 Ah, chili: The ultimate one-pot meal! No mixing bowls or other kitchen equipment required for this hearty recipe. Just brown the ground beef, add the remaining ingredients, and cook until veggies are soft. It makes eight servings, so leftovers are likely. This means you only have to clean one pot for several meals! Stir-frys like this Asian-inspired dish are perfect for those who loathe a lengthy kitchen cleanup. 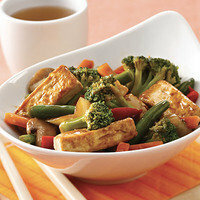 If you're skeptical about tofu, this is a good beginner recipe: The tofu is cooked perfectly, and it's full of flavor! 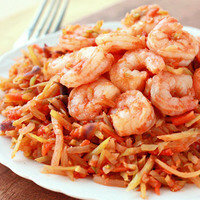 You can also make this recipe with chicken breast or shrimp. Give it a shot! 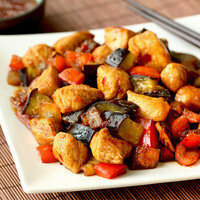 Here's another stir-fry favorite, this time featuring chicken! 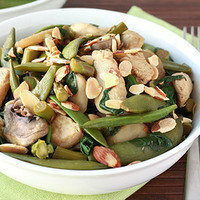 It's chock-full of veggies like snap peas and asparagus, plus water chestnuts and almonds for serious crunch. With this recipe, dinner will be ready in under half an hour, and cleanup takes just a few minutes. Who loves you? Teriyaki marinade + sweet Asian chili sauce = magic! And since eggplant soaks up the flavor of other ingredients, the veggie becomes insanely delicious in this protein-packed stir-fry. Plus, you'll go from chopping to eating in under 30 minutes. Love it! This dish involves three ingredients, one pan, and zero reasons not to make it all the time! The broccoli cole slaw cooks down to a noodle-like consistency that is soooo good. Top it off with marinara sauce and stir in some shrimp (a freezer staple), and you're DONE. It's simple to make, and all that protein leaves you feeling satisfied. Even more satisfying is the minimal cleanup required! Chances are, you've got more than a few friends who could use these one-pot meals. Click "Send to a Friend" to make their day!